Sight: The entrance is sleek, clean - modern Zen has been an inspiration. White marble and wooden floors are offset by beautiful jewel colored paper lanterns in the middle of the reception. I was shown to the locker area, where a white robe, towel and slippers where waiting to be traded with my heavy school bag and jeans. The locker area leads into a long room with raised wooden slate tiles on the floor, lined with frosted glass doors closing off restrooms, showers, sauna AND steam rooms! I loved that there was an information plaque beside the sauna, educating you on the benefits of the experience you are about receive. At the end of the wet room, you find the entrance to the treatment area. Bunya Cit Spa literally wants to whisk you away to another world! The treatment areas are sectioned off by frosted sliding glass doors, each room decorated with items and murals from all the cultures they are inspired by. Going even a step further, they were creative enough to have a curved raised ceiling over the entire area representing a traditional thatched roof in Japan! Sound: Bunya Citi Spa had the most eclectic mix of music I have had playing during a treatment. Starting with a zither and mandolin to soft drums, pan pipes and a dash a nature sounds. Smell: At the beginning of the treatment, the room itself smelled slightly of eucalyptus and ginger. But when the Herbal Compress aspect of the session came into play - the sweet and calming mix of licorice, green tea, ginkgo, lemon grass and ginseng was an overwhelming pleasure to inhale! Taste: Water and Tea where available for the sipping back in the wet room. 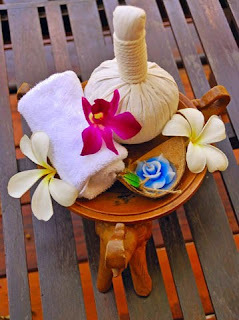 Touch: Knowing I was going in for an Oriental Herbal Compress and Thai Massage - I was open minded and eager to see what exactly this treatment would feel like! I am so glad I went into this session with the spirit of - What's this? I started face down, and Ruby came in to check if there was anything else I wanted to add to the information I had shared on my intake. Then she got to work! She warmed up my whole body with compression through the sheet - and when my back was nice and warm - she climbed on the table and started deeper compression using her hands, feet and whole body! While I still had my head in the cradle, she used these small hot moist bags of herbs to rub all over my back, compressing my legs, arms and neck - the mix of moist heat, aromatherapy and pressure was fantastic! Ruby continued with many standard Swedish stokes - but used new stretches and body manipulations to make sure that my muscles were loosened up but ready to get back out into the world! Following the session, I was sure to check out both the sauna and steam room. Loved: It's interesting, now that I am studying Shiatsu, I recognized what meridian points therapist are using - and it adds a whole new level of appreciation for their work. Learned: Ruby incorporated a stretch of my quadriceps in a prone position, while using her other hands to petrissage my anterior leg - I immediately put this move in my pocket as a great way to address the whole leg at once when time is taken up focusing on specific issues.